Submitted by Alexander Briones on Apr. 11, 2018..
91 out of 100. Incorporating 950+ ratings and reviews. The Rokit 5 G3 is not your typical flat response monitor, rather it is designed for DJs and producers who are looking for more bass from smaller studio monitors. It brings with it the same yellow woofer scheme and stylish exterior as the bigger Rokits, only this one is meant for beginners and for those with small home studios. The same reliable build and sonic quality is also utilized, albeit with the sound levels being a bit tamer, and more importantly this is the most affordable of the Rokit line. It pairs a 5" woofer crafted from kevlar and aramid fibers with a 1" soft dome tweeter, and both speakers are protected via a built-in limiter system. 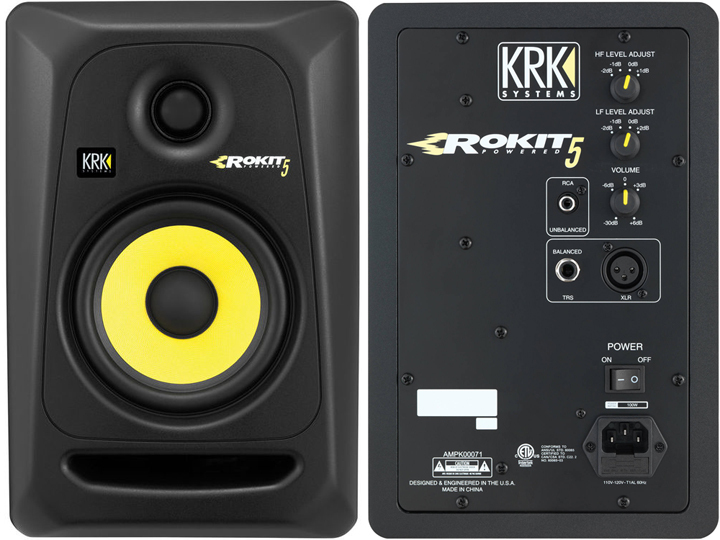 KRK's front-port design allows the Rokit 5 to have more low-end than others with the same speaker size. Dimensions: 11.2" x 7.4" x 9.7"
Many (over 700) users and experts gave this speaker their thumbs up, and reported that it exceeded their expectations. It is described as having a big and clear sound, and has enough power to fill the average home studio. There were also some users who were happy with how stylish the Rokit 5 G3 is. Some users commented that while it can get the job done, you're still better off with a flat response monitor if you'll mostly work on non-bass heavy musical styles. There were a few who reported that adding monitor isolation pads helped reduce bass buildup, and improved their monitoring experience with the Rokit 5 G3. If you're just getting into mixing or you want a compact monitor with some low end capability, then the KRK Rokit 5 G3 is a good choice. In fact it was on our main recommended list until April 2018, at which time we switched to recommending the slightly higher rated 5" monitor: JBL 305P MKII.